Last year around this time I blogged about the question: How much does bad data cost LG Commercial Displays? Even though over the year we have made good headway in this regard, most of the work still targets the same objective: Gathering and consolidating information about customers and leads in order to learn about their behavior and use this information to do more direct, effective and economically efficient marketing. The task has been more extensive and complex than expected given the nature of the business. 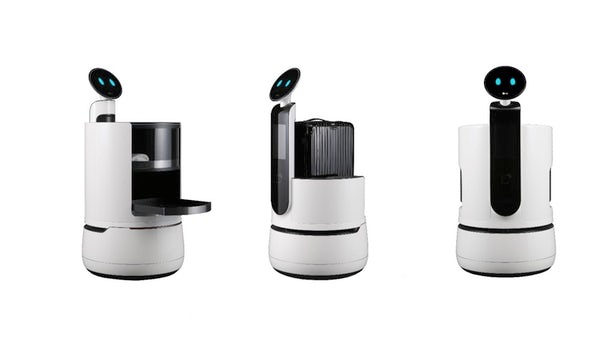 On one hand there are several verticals (Hospitality, Signage and Small Monitors), each with multiple sub-verticals, combined with sales that can go directly to end users, resellers or distributers. Most of this activity is managed by several sales teams. Over the last year most of the customer, lead and new target company information has been organized in such a way that today it is possible to specifically target any combination of these for marketing or sales purposes. This work prepared the company for the latest marketing trend known as Account-Based Marketing (ABM). In more tangible words, ABM is the product of an increasing overlap between marketing and sales enhanced by customer relationship management (CRM) software and technology. The digitalization of business is changing the B2B buying process. In the past marketing focused on top-of-funnel and sales took the leads and tried to close them. Today sellers are acting more like marketers, relying on data and analytics to first make meaningful connections and eventually increase sales. No doubt good headway has been made over the last year from a marketing data organization perspective and now LG Commercial Displays can strive for the ABM implementation. The latter is certainly quite an undertaking as well, requiring close collaboration between marketing and sales for training purposes on mass emailing, qualifying/disqualifying leads, preparation of email templates, reporting, etc. There are still additional aspects to consider on an ABM strategy, such as complementing the target companies with relevant marketing content in a coordinated programmatic media action. However, this might be enough material for the next blog. In any case, marketing analytics at LG Commercial Displays is progressing toward its objective of more effective and economically efficient marketing. It can pack more functionality, use considerably less power and cost only a fraction of a central processing unit (CPU). And it can be found in smartphones, tablets, some laptops, and most commercial displays. It’s called System on Chip (SoC). And it’s working hard to lower the cost of digital signage deployments. A digital signage display installation usually requires an external content source such as a PC or other media player to be connected to the display with cables. With SoC displays, however, the playback device and its connecting cables are eliminated. Instead, an integrated circuit puts all the typical components of a computer on a single chip, which is embedded inside the display itself. By using commercial displays with SoC, signage network operators can eliminate the hardware cost and complexity of a separate media player and its related cables and mounting accessories. SoC streamlines installations by consolidating everything needed for a digital signage network inside the display, requiring just a single power cable connected in the rear and a Wi-Fi connection. LG and a number of other display manufacturers offer commercial displays with embedded SoC, and hundreds of CMS software companies are offering solutions that fully run on SoC. LG commercial displays with embedded SoC, running LG’s webOS 3.0 for signage operating system, have the multimedia capabilities and critical management tools to address enterprise-class requirements. The CMS partner eco-system for webOS for signage is growing, with more than a dozen CMS companies in North America and more than 100 globally, adding more and more capabilities to digital signage with SoC. Systems integrators can download useful content and develop customized applications that fit their exact needs, and update it simply and quickly via a smartphone or tablet. Depending on the application, digital signage with SoC may be the perfect solution. It will save both time and costs, and equip your signage network with attention-grabbing content that is easily created, updated and managed in real time from a central location. There’s more to know, and Dave Haynes of Sixteen:Nine has written a deep dive into SoC, reflecting his own observations and the opinions of dozens of industry people. 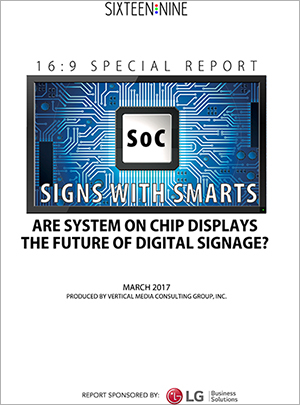 It’s an excellent resource to download and keep for reference even if you’re not considering a SoC digital signage deployment just yet. Click on Dave Haynes’ report above and download it now. LG Medical Imaging Displays Are Coming to HIMSS18, Bringing Accuracy from Every Angle. In medicine, the smallest things can often make the difference between blindness and sight, mobility and paralysis, life and death. Medical professionals of every kind understand this, and the tireless pursuit of ever finer details guides everything they do. This is where LG Business Solutions can help. LG offers a newly expanded lineup of extremely accurate, DICOM Part 14 compliant medical imaging displays for patient care from registration to examination, to diagnosis and treatment. The full line will be showcased at the HIMSS18 (Healthcare Information and Management Systems Society) Conference & Exhibition, LG booth #10910 (Level 1 Hall G), March 5-9, at the Venetian – Palazzo – Sands Expo Center in Las Vegas. LG has leveraged years of industry-leading flat-panel technology expertise in the design of these displays. All models feature LG’s renowned IPS (In Plane Switching) technology, which provides a true 178-degree wide viewing angle. IPS makes it possible for multiple medical professionals to view the same display from different angles and see the image with crisp clarity and minimal color shift. Each display is engineered to deliver peak performance in its category. LG’s new 3MP Diagnostic Monitor is the first product in the diagnosis category for LG. Its 21.3-inch, 3MP (1536 x 2048) IPS screen is capable of impressive brightness levels up to 1,000 nits, and a built-in calibrator checks which colors need to be adjusted. LG’s new 1.3MP Clinical Review Monitor features a 19-inch, 1.3MP (1280 x 1024) IPS screen with a 5:4 aspect ratio and can seamlessly connect to existing hospital equipment while maximizing space. LG’s 8MP Clinical Review Monitor is a 27-inch IPS monitor with 3840 x 2160 resolution designed to increase hospital staff efficiency by enabling streamlined workflows and multitasking. LG’s 8MP Surgical Monitor delivers unparalleled clarity with a 27-inch, IPS 8MP UHD screen. It covers over 99 percent of the RGB color space with additional space dedicated to the deep red spectrum, enabling doctors to more easily distinguish between different types of tissue and blood vessels. High luminance of up to 800 nits makes it ideally suited for bright operating rooms. The front panel is IP35 rated and the back panel is IP32 rated, protecting against dust, water or fluids. The flat surface allows for easy sanitization of the panel and control buttons. All LG medical imaging displays are compliant with DICOM Part 14, which means that grayscale tones are measured and set on the production line to maintain image accuracy and consistency over time. The displays also come equipped with backlight stabilization technology to maintain stable luminance levels across the entire screen, and are finely calibrated to ensure consistency across multiple devices. Dynamic Sync Mode reduces input lag and provides a rapid response time, ensuring precise imaging with diagnostic scans and surgical procedures. Flicker Safe and Reader Mode settings help minimize the eye strain often experienced by doctors and nurses working long shifts. No matter how you look at it, you’re going to like what you see at LG booth #10910. You Just Installed a Large Digital Signage Network. What’s On the Screens? 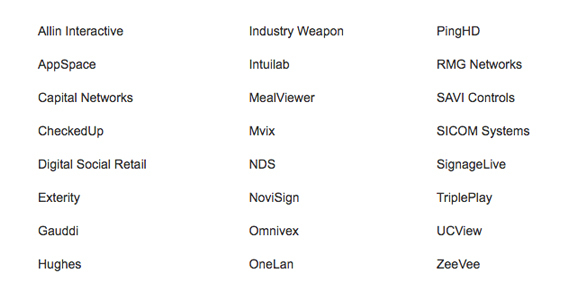 Resellers and systems integrators know the importance of providing total hardware solutions for their clients. Let’s say you just completed a large install and your client’s displays are all up and running perfectly. Great job! But have you spoken with them about content? Specifically, who’s going to do the art and copy to ensure customers are attracted to the displays and hopefully take action based on the message? And who will do the programming and manage the content from day to day? In the world of digital signage, content (with strategy) is king. Consider this. When digital signage first came on the scene years ago, customers saw those large format displays and were wowed by the big pictures. Many at that time wished that one day they could have a TV that big. Fast forward to now. Many people do have TVs that big. They’ve become accustomed to seeing big, beautiful pictures, right at home. And they can change the channel anytime they want. It’s something to think about. An effective digital signage deployment shouldn’t get stale. The content should be refreshed periodically. Elements changed. Messaging tweaked. This way, the digital signage maintains its attraction. The last thing a business owner needs is to have their digital signage ignored due to familiarity. If customers walk past a video wall and are looking only at their smartphones, something is wrong. Content creation and management aren’t things to simply hand off to a staff member unless it’s a dedicated digital creative staff member. For maximum effectiveness, there’s a lot to the job. Are you partnered with an ad agency or marketing company that offers digital media creation and management services for digital signage deployments? This is a major value-add to offer your clients with every sale. And the bigger the business, the greater the need can be for such a service. Content as a service can also bring in a nice chunk of change for an ad agency or marketing company looking to expand their offerings. It’s an exciting new frontier to launch into as the demand for digital signage just keeps growing. Taking a consultative approach, a content partner can work with your client to develop top-quality digital media content to impress their customers/visitors, enhance the look and feel of the business and increase revenue. A content partner can work closely with them to ensure an accurate and consistent brand image. And a content partner will use best practices in design and layout, taking into consideration the types of displays, the location of displays and the viewing distance from the displays. As we look into 2018 and think about ways to offer more and better solutions to our clients, let’s always keep an eye on what’s in the big picture.